Nowa Huta and Novi Beograd: even when tracing their semantics, a feeling of novelty is present, one denoting the Polish and Yugoslav quests toward a modernised future. Both socialist governments tested the emerging modernist concept of the city as a machine for living; in doing so, they created fascinating environments that could inspire its subjects to think of the boundless possibilities regarding the mass production of the right to inhabitation. Although both Nowa Huta and Novi Beograd were embedded in a complex social modernist network of meanings, it is their pragmatic function which proves fundamental in their transformation into modernist habitation machines, and, as a result into concrete utopias. There is something very meaningful in the fluctuant ambiguity derived from MoMA’s newest exhibition and its title: Toward a Concrete Utopia: Architecture in Yugoslavia, 1948–1980, opened in July 20181. Obviously, it is about concrete, the composite material of prefabrication. Beyond it, however, there is more: there is hope for a utopia to be concretised in reality. In his seminal 1923 essay Toward an Architecture, Le Corbusier inspired urban theorists and planners to conceive and construct mass-produced houses as a form of inhabitation proper for a new epoch. Obviously, planning played an important role, mediating the work of the architect and the collective necessities of the people. While the Corbusian perspective was strictly technical, a definitive answer concerning whether he was right or wrong plays is less important in the given context. More significant is that he tried to solve the contradiction between the growing density of urban population and the disintegrating idea of the public space as an accessible, common good. The solution was envisaged in a project of a tower city, by designing a settlement of 60-storey blocks sunk in parks and greenery2. One compelling critical voice in the epoch came from Theodor W. Adorno, who criticised the very idea of architectonic planning by virtue of its ready-made nature and its failure to address individual needs3. The problem with the charge of being mass produced is obviously that it disqualifies every advantage of industrial capitalism, even in its revolutionising aspect. In this respect, such criticism can be rendered futile; an interesting way of countering this train of thought is to think of housing in terms of hardware—which, just as mass produced computer hardware, can give a base for individualised hacking of pre-programmed social settings. There is always room for customisation, as long as the hacker/dweller is interested in innovation and change. The accelerated accumulation of capital has rendered older Eastern European critiques of architectural utopias—regardless of their mild/combative tone—deprecated. While the Eastern European modernist settlements were often accused of poor quality of construction or lacking facilities, these charges have been overcome by sheer engineering during refurbishment processes in the late 1990s and early 2000s, at least in most of the cases in Poland, Czech Republic or Slovakia. Elementary prerequisites made available for the masses by modernism—such as sunlight, greenery, or wide vistas—have not become depreciated, but are generally thought of as reactionary. Additionally, the charge against run-down block neighbourhoods, based on Western experiences of the likes of Jane Jacobs, clearly does not live up to the reality of Central Eastern Europe4. Another too frequently invoked argument —based on the idea that only the affluent class can afford a modernist utopia—needs to be entirely invalidated. This is because history proves otherwise. It was as affordable for the relatively poor countries of socialist planned economies, as it is now for the wealthy turbo-capitalist Central Eastern Europe5. The rather reasonable conclusion that modernism posed itself as a civilising and hygienic transformation is too often mixed with the flawed reasoning that utopian modernist blocks ‘unlearned’ people to properly live. The actual flaw is, in fact, to presuppose that some natural state actually existed, when the humanity had known how to live6. Too much of this based on a pre-modern nostalgia. There is no coming back. As the time passed by, Central Eastern European socmodern architecture has become appreciated for its aesthetic value; however, this also implies a tacit rejection of its utopian aspect, for utopia is rooted not in the form, but in the function that shapes social relations7. Despite this, most of the reappraisal process has followed prevailingly the aesthetic of socmodern architecture8, while the negative association of prefabrication and automated construction was further proliferated. If the utopian aspect of modernist architecture was ever admitted, it was done mostly in opposition to the pathologic practices of urbanism in contemporary capitalism9. Nowa Huta is Cracow’s Easternmost neighbourhood inhabited by about 300 thousand people, almost 40% of the city’s inhabitants, built completely under real-socialist rule and known for the Stalinist architecture of its urban core10. The utopian endeavour to build an ideal city around steelworks could be, indeed, in the same time somehow disturbing, as disturbing was a Taylorist overtone of the real-socialist industrialisation policy. However, probably much more disturbing is the irony with which prominent intellectuals, politicians, and other centres of discourse production used to talk about the project of an ideal city. The ideal of emancipation had failed—they suggested—so the mere attempt to achieve it becomes pointless. As for the attempts to rehabilitate real-socialist heritage, what is frequently overlooked by the aesthetes is the quintessential modernist spirit of Stalinist urbanisation. Ornamentation, this characteristic expression of ‘national form’ in socrealism, is of tertiary importance. A prevailing logic of rationalisation, mass production, and scientific engineering is employed to ensure a growing living standard. From this standpoint, socrealism is not so different from ‘typical’ modernism due to the shared lineage of urban planners and architects alike. Furthermore, the model proposed by an archetypal Stalinist city is, in fact, planned according to a rational early modernist urban grid. This kinship between the socrealist Nowa Huta and other high modernist utopias is therefore not surprising; for instance, parallel with Brasilía was correctly acknowledged by their harshest critics from the conservative right. The problem was, they used to say utopia as if it was a bad thing. Later Nowa Huta settlements, built after Stalin’s death and the subsequent thaw (1953/56), were planned in accord with a Corbusian plan libre. Both the older and the newer parts of the neighbourhood lacked certain features included in their original plans, most significantly the city hall, a central culture palace, as well as some commercial facilities; both planning stages had certain flaws in their construction quality. These flaws were mercilessly pointed out later on by critics, despite that the holistic process of planning and constructing was hindered by the course of history. Moreover, such criticism is not just petty, but it also fails to account the existing context. The phenomenon of Eastern European modernist settlements is rooted in the unprecedented construction of massively accessible housing in the world’s semi-periphery. Whereas the moaning of an aesthete-architect seems to intentionally overlook the social impact of brought forth by such planning. Much more than that, the irrelevance of the argumentation stressing exclusively the poor quality of mass produced housing is solidified by the rapid renovations of the 1990s and 2000s, when no massive state funding was provided. Drawing on Zygmunt Bauman’s work Socialism, The Active Utopia, Katharine Lebow argues that it is the very incompleteness of modernist endeavours that may work as an impulse for utopian thinking, where a better world can be achieved especially because it is still unfinished and requires an additional effort to be11. The right to habitation (effectively realised under real-socialism) is a system essentially different from, if not antithetical to the existing one, where mortgage, excessive rent burden, and homelessness belong to the most crucial pillars of capital accumulation. A modernist synthesis of urban density and access to public greenery, successfully implemented in the socrealist and highly modernist Nowa Huta, is a real-existing manifesto of negation against a planet of slums scenario. A landscape marked by urban multi-lane highways, scant and disperse pedestrian crossings,accessible only via steep stairs, dilapidating buildings, spaces whipped by wind or burnt by sun; this could possibly be a depiction of Novi Beograd—Belgrade’s high modernist neighborhood built since 1948 in Tito’s Yugoslavia. However, this would be a very one-sided view, which’d ignore the fascinating brutalism-inspired architecture of the many housing complexes, as well as, more importantly, the ambitious effort to provide the rural country with hundreds of thousands relatively comfortable flats, until today pretty appreciated by the Serbian population. It is the intertwining of a demanding endeavour in itself and its futuristic aesthetics—eagerly adopted by Yugoslavian architects after 1968—that has made Novi Beograd one of the symbols of utopian thinking in Central and Eastern Europe. What needs to be admitted, however, is that indeed the post-war construction of Novi Beograd notably ignored the tragic context of the former concentration camp Staro Sajmište located nearby13. But it was the late capitalist construction of the Belgrade Waterfront, located on the site of the Sava River opposite to Novi Beograd, that brutally displaced locals, as well as war refugees camping in the post-industrial zone between the old Belgrade railway station and the river. The success of many modernist housing projects in Central Eastern Europe can be measured by understanding their social cohesion. Obviously, certain inequalities were already present under socialism, with even more emerging later on. But, in the case of most neighbourhoods in the Visegrad and post-Yugoslav countries, the social cohesion of such modernist settlements was much bigger than of the alms provided by the capitalist West14. However, this may prove the Corbusian motto Architecture or Revolution wrong: it was the social revolution that enabled to create a socially mixed neighborhood, so desirable in urban planning everywhere. It is true that walking longer distances in New Belgrade can be a dystopian experience, yet it is also true that even then the architectonic experience is of a lost, unseen future. When it comes to the neighborhood’s deficiencies, they cannot be seen as something fundamental: even a painfully imperfect regime of the stagnant capitalism in the Visegrad countries of 1990s succeeded in mitigation of the flaws of modernist construction by sheer engineering. So it is a task for an engineer (obviously, in a dialectical process with the community) to solve problems of Novi Beograd, while it is our task to assert that modernist utopia of habitation machine is safe and sound. A portrait of the modern world where more than 1 billion people dwell in slums, as drawn by Mike Davies in the Planet of Slums, is gloomy and dim. Nor are Soviet modernist developments spared by his description, sentenced to poverty and dilapidation by the new Russian political elites of the transition era. However, this is more of an exception, both political and architectonic one, as most of the slum building are informal constructions in various cities around the globe15. A few years ago the engaged urban critics from the left discovered radical architecture—pragmatic, localised interventions, accepting existing circumstances and gradually empowering the excluded of Latin America. Obviously, one can be fascinated by the optimism and strength of beliefs that Latin American urban and architectonic activists share16. This fascination was symbolised by rewarding prestigious Prizker Prize in 2016 to Alejandro Aravena, a Chilean radical architect. Nonetheless, there is certain powerlessness behind radical architecture, a tacit acceptance of slum reality and the world of exploitation it stems from. Recently hyped notion of utopia is a chance to imagine a world without injustice, a reality which is about something more than fixing run-down neighborhoods. Imagining means also planning. No wonder that Boris Buden and Darko Suvin discussing Yugoslavia so easily turned from the dissolved state and its architecture to science-fiction literature, and from sci-fi to a need for planning, and what is more—intelligent planning17. Universalist creed for the future demands certain power to transcend the existing circumstances and to make new commitments for a new epoch. Such a creed can be at least somehow inspired by the atmosphere of 1960s Yugoslavia, cosmic ambitions of the era, huge planned neighborhoods such as Novi Beograd and its rocket-resembling, brutalism-inspired buildings. There are certain other signals pointing to the utopian, transformative dimension of modernist housing projects. As most significant material remnants of real-socialism, they belong to the future—given that capitalist transition was a ‘return from the future’, according to Boris Groys. At least until few years ago, the only perspective on utopia in the Eastern European peripheries was to notice its traits in cultural nostalgia, reflected in works of art labeled as ‘retroutopian’ or ‘retroavantgarde’. This movement cannot be simply classified as anti-utopian and reduced to exploring ambiguities of the totalitarian aesthetics. Its important component is to ‘traverse a circular way through the past toward the future’, which is done, for instance, by Marko Peljhan or Vadim Fishkin when they rediscover Russian avantgardist Vladimir Khlebnikov or Yugoslavian inventor Nikola Tesla and their ideas18. No wonder Slavoj Žižek made a significant appearance in a Croatian mockumentary Houston, We Have a Problem about the alleged Yugoslav space program, given that he had orbited on the fringes of the art group Neue Slowenische Kunst, which i.a. explored the ideas of cosmic conquest conceived by a Slovene engineer Herman Potočnik Noordung in the 1920s. The thing is, there was only one successful cosmic project in the world periphery and a whole multitude of urban revolutions. If we traversed a circular way through the past, we could imagine such an urban revolution that would be able to solve a current nexus of problems connected to the over-urbanization, housing shortage and ecological crisis. Were every city designed as a sort of enhanced East European modernist settlement (instead of being an unending chain of slums with some luxury enclaves intruded), a surface of Earth overburdened by human inhabitation would be about twice less as today, and this at population of 10 billion, as forecasted for 2060. An idea of the whole world becoming modernist Nowa Huta or Novi Beograd is tempting. If we agree with an accelerationist idea of making new commitments for the future19, then mass-production of housing and urbanity, inspired by the successful modernist projects, should be one of them. Given the galloping prices of real estate, no longer treated as a machine for inhabitation, but merely a factor in capital accumulation (and this a crucial one20), mass-produced houses are remnants of the future, able to break away with the capitalist mode of profit monopolisation. Until now our political imagination has been so cramped that an idea of virtually free urban housing could only emerge reactively, as an answer to the barbaric neoliberal speculation and cruel practices of evictions. A modernist utopia which has got real was long forgotten, a potential for construction of standard social hardware was dismissed as authoritarian, while its ability to provoke and condense infinite social software interactions used to be ignored21. But the utopia coming from the lost future can probably only happen as a part of a real political movement and a new common sense, as a demand going beyond a pretension of intellectual purity and ripe to become a part of a widely resonating manifesto. There is a better explanation of socmodernism hype, kindling a few years ago and now slowly fading, rather than a cyclic circulation of nostalgias. These buildings are a utopian negation of the pathological capital accumulation in the sphere of real estate since the 1970s22. These spectres of lost futures—Novi Beograd, Nova Huta and plenty others—are calling for new manifestos for space, housing and architecture. I would like to express my gratitude to the editing team of the Kajet Journal for suggesting numerous stylistic and argumentative improvements. I have followed most of them, while all the quirks, idiosyncrasies, and mere errors are on me. 2 Le Corbusier, Towards a New Architecture, trans. F. Etchells, New York: Dover 1986. We will ignore here typical American criticism of the modernist project under the aegis of Jane Jacobs—instead, later on we will confront us with ‘concrete utopias’, peripheric embodiments of the Corbusian principle in Novi Beograd and Nowa Huta. 3 Th. W. Adorno, Functionalism Today, in: N. Leach (ed.) Rethinking Architecture: A Reader in Cultural Theory, New York 1997. It is a rather well-known fact that Adorno was opposed to all forms of utopian thinking, perceiving them as projections of bourgeois past into the future and suggesting them being merely imaginative excesses (cf. e.g. Th. W. Adorno, Imaginative Excess, in: idem, Minima Moralia, trans. E.F.N. Jephcott, London: Verso 1989). The question whether a total rejection of utopian moment in thinking belongs to critical thinking or it is already a critical reflex belongs to a separate paper. 4 E.g. J. Trybuś, Le Corpusier – między utopią a rzeczywistością, “Autoportret” 4/2005, pp. 8-11. 6 V. Czumalo, J. Junek, Oduczyliśmy się mieszkać, “Autoportret” 4/2005, pp. 12-15. 7 If we wanted to use temporarily the binary distinction between form and function. 8 I.e. after demolishing Supersam self-service shop (1962, arch. J. Hryniewiecki, M. Krasiński, E. Krasińska) in Warsaw. In 2008 an exhibition Cold War Modern at the London’s Victoria & Albert Museum followed. A good example of aesthetic approach to ‘socmodernism’ is presented by a whole issue of the Cracow-based journal Herito 17-18/2014-15. 9 E.g. M. Link-Lenczowska, Szkice techniczne z demokracji bezpośredniej, “Herito” 17-18/2014-15, p. 220 and the remark on the exhibition Za-mieszkanie 2012. Miasto ogrodów. Miasto ogorodzeń organized by the Autoportret journal. 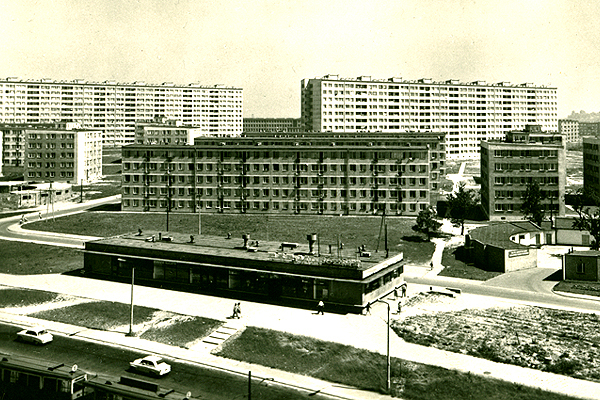 10 In the first phase (1949-1960) Tadeusz Ptaszycki was a main urban planner of Nowa Huta. Later on the original design was extended with two large high modernist settlements. The first was Bieńczyce, planned by Jadwiga Guzicka and developed in the years 1959-1979, the other was Mistrzejowice after a plan by Witold Cęckiewicz, designed and built in the years 1963-1982. 12 Lj. Blagojević, Novi Beograd: Reinventing utopia, in: Ł. Stanek, Ch. Schmid, and Á. Moravánszky (eds.) Urban Revolution Now: Henri Lefebvre in Social Research and Architecture, Farnham 2014, pp. 304-305. 13 So had a Warsaw’s socrealist district Muranów risen on the ruins of the ghetto, sparking some controversies in the 2010s (see e.g. B. Przymuszała, Nieistniejący mur? Problemy z opisem Muranowa, “Przestrzenie Teorii” 24/2015, pp. 97-108). 14 M. Petrović, Istraživanje socijalnih aspekata urbanog susedstva: percepcija stručnjaka na Novom Beogradu, “Sociologija” 1/2008, p. 76. 16 J. McGuirk, Radical Cities, London: Verso 2014. 18 B. Buden, Zone des Übergangs: Vom Ende des Postkommunismus, Frankfurt am Main: Suhrkamp 2009. For concrete reference in this fragment I have used Polish translation: idem, Strefa przejścia, trans. M. Sutowski, Warszawa: Krytyka Polityczna 2012, pp. 139-159. 19 The idea of commitments as a modality for designing the future – as opposed to critical reflexes of the kitsch Marxism – is borrowed from the Reza Negarestani’s text Labor of Inhuman (in: R. Mackay, A. Avanessian (eds.) #Accelerate, Falmouth: Urbanomic 2014). Political implication of this concept has been explored by Nick Srnicek and Alex Willis in Inventing the Future: Postcapitalism and a World without Work (London: Verso 2015) – I have built my argument especially on their criticism of a tendency to moral purity among a big part of emancipatory movements and their proposal of a new common sense. 20 Role of real estate markets as one of the fundamental pillars of financialized economy, i.e. FIRE markets (finances, insurances, real estate) and its implication for inhabitation, urbanity, creation and satisfaction of human needs is well described by D. Harvey, Rebel Cities: From the Right to the City to the Urban Revolution, London: Verso 2012, pp. 27-66. 21 At the margin of the hardware-software metaphore it should be noted that also hardware can be tuned and overclocked in an endless chain of experiments to achieve new social norms. Such new norms may be explored in the future e.g. by a promising movement of xenoarchitecture (v. xeno-architecture website, www.perhapsitishightimeforaxenoarchitecturetomatch.org). Intertwining of social relations and architecture, far more complex than Corbusian parole architecture or revolution, was examined already in the 1920s by Soviet constructivists, e.g. Moisei Ginzburg (v. Ginzburg’s programmatic articles in the issues of Sovremennaya arkhitektura from 1927-28). Polska jest przeplanowana1. Trudno o bardziej kontrintuicyjne stwierdzenie – a jednak to prawda. Uchwalone do 2011 roku plany zagospodarowania przestrzennego przewidują zakwaterowanie 77 milionów ludzi, a studia uwarunkowań i kierunków zagospodarowania – zabudowę na 316 milionów mieszkańców2. Rzecz nierealna ani po potencjalnym przyjęciu nieludzkiego ustawodawstwa reprodukcyjnego w stylu Ceauşescu, ani po największej nawet fali migracji. Bloki na Bemowie i bloki w Hongkongu. Źródło dla fot. 1: E. Kołodziejczyk (1977), Cyfrowe Archiwum Bemowa. Kraków też jest przeplanowany. Póki co obserwujemy zgubne skutki zabudowy miasta bez uchwalonych planów zagospodarowania i w oparciu o arbitralne decyzje administracyjne – warunki zabudowy3. Urbanizacja pełzła niemal we wszystkich kierunkach, powodując rozlewanie się bezforemnych przedmieść po sąsiednich powiatach. Największe skupiska nieplanowych osiedli powstały na południu Krakowa (Ruczaj, Kliny Borkowskie), południowym-zachodzie (Złocień) i jego północy (Górka Narodowa, Bronowice Wielkie). Dowcipnych komentarzy doczekały się nadmierne zagęszczenie zabudowy Ruczaju4 i łanowa zabudowa odrolnionych działek5. Jeszcze kilka lat temu jako panaceum urbaniści i aktywiści miejscy jednym głosem wskazywali sporządzanie planów zagospodarowania przestrzennego. W pewnym momencie do chóru dołączyli (choć nieco nieczysto) polityce – pokrycie całego Krakowa planami znalazło się w programach samorządowych z 2014 Jacka Majchrowskiego, Łukasza Gibały i Platformy Obywatelskiej. Spójrzmy więc, jakim lekarstwem na chorobę chaosu przestrzennego są uchwalane plany zagospodarowania przestrzennego. Pod lupę zostały wzięte krakowskie miejscowe plany (MPZP) dla Żabińca Południe i Prądnika Czerwonego Zachód. Obliczone zostało, jak dużo bloczków można wybudować, trzymając się ustaleń planów. Na potrzeby naszych rozważań przyjęliśmy maksymalną dopuszczalną zajętość terenu – taka jest po prostu normalna praktyka deweloperów. Z drugiej strony obliczenia dokonane zostały przy założeniu podziału uzyskanej powierzchni mieszkalnej (80% PUM z powierzchni całkowitej) na statystycznie średniej wielkości mieszkania (59,5 m²), zamieszkiwane przez przeciętnej wielkości gospodarstwo domowe (2,5 os.) – co stanowi wartości raczej optymistyczne i jest dawaniem forów deweloperom. Powierzchnie obszarów do zabudowy zostały wytyczone przy użyciu miejskiego narzędzia do badania planów zagospodarowania – w przypadku nieścisłości, powierzchnie obszarów były zaniżane. W MPZP Żabiniec Południe osiem obszarów przeznaczono pod zabudowę usługowo-mieszkalną (1UM-8UM). Pierwsze pięć (1UM-5UM) mieści się między łącznicą kolejową, umożliwiającą przejazd z dworca towarowego na linię warszawską, małą obwodnicą kolejową oraz ulicą Doktora Twardego wraz z linią tramwajową na Krowodrzę. Pozostałe trzy (6UM-8UM) obejmuje w dużej mierze już zabudowane kwartały kamieniczne między ulicą Kamienną, linią kolejową na Katowice oraz linią na Warszawę. Nawet tam nie zrobiono użytku z obowiązującej linii zabudowy – narzędzia, które zobowiązuje do projektowania fasad w miejscu ustalonym przez planistów, a więc zazwyczaj wzdłuż ulicznej pierzei. Deweloperzy mogą więc stawiać swoje budynki w dowolnych miejscach, nie dbając o logiczny i przyjazny pieszym układ przestrzenny. Plan dla kwartałów kamienicznych – oprócz ignorowania linii zabudowy – w zasadzie sankcjonuje stan obecny. Dozwolona wysokość zabudowy to pięć kondygnacji, założeniem było też przeznaczenie całego parteru pod usługi. Na powierzchni przeznaczonej pod zabudowę – 2,8 ha – można więc zakwaterować 726 osób, co daje gęstość zaludnienia 25 930 os/km². Jest to wartość wyższa niż w wyludniających się kamienicznych dzielnicach śródmieścia (do 13 712 os./km²)6, ale niższa niż na osiedlach modernistycznych (28 200 os/km²)7. Dużo ciekawsze rzeczy dzieją się na obszarach przeznaczonych pod nową zabudowę. Powierzchnia obszarów 1UM-5UM wynosi ok. 17,10 ha. Dozwolona jest zabudowa 6-kondygnacyjna (1UM-2UM) bądź 10-kondygnacyjna (3UM-5UM). Przy założeniu, że parter przeznaczony jest pod usługi, oznacza to, że zakwaterować można tu 6 890,76 mieszkańców. To zaś oznacza gęstość zaludnienia 40 296,82 os/km² – niesłychaną nawet na najgęściej zaludnionych osiedlach modernistycznych, a w Europie spotykaną tylko w najbardziej przeludnionych kwartałach Paryża i Barcelony8. Bez zalety bycia Paryżem czy Barceloną. Nie inaczej poczynają sobie planiści w MPZP Prądnik Czerwony Zachód. Również i tu nie fatygują się, by wyznaczyć obowiązująca linię zabudowy, mimo że większa część planu reguluje dawne centrum przedmiejskiej wsi, w którym sporo już było pierzejowej zabudowy. Te stare parterowe domki-kamieniczki całkiem nieźle uzupełniały dobrze zaplanowane osiedle modernistyczne, powstałe na dawnych gruntach wiejskich. Niestety, duża część starej zabudowy została zdemolowana przez zabudowę łanową, powstającą na podstawie decyzji administracyjnych o warunkach zabudowy (WZ). W przeciwieństwie do starych domów i kamieniczek, nowe bloki do głównej osi osiedla odwrócone były parkingami, a rozciągały się wzdłuż fragmentów dawnych rozdrobnionych łanów rolnych. Czego nie zdążyła zniszczyć samowola dewelopera, to dopełnił „planista”. Jedynie w obszarze między ulicami Łepkowskiego i Majora (obszary MW.3 i MW.4) szacowana gęstość zaludnienia według planu może wynieść 26 506,60 os/km² (przy szacowanej liczbie mieszkańców 1 298 i powierzchni 4,9 ha). To jednak wyłącznie usankcjonowanie stanu obecnego – istnieją tam przecież bloki modernistyczne. Pod nową zabudowę przeznaczono – też w pewnej mierze już zabudowane po 1989 – obszary na północ (MW.1-MW.2, U/MW.1-U/MW.5) i południe (MN/MW.1, U/MW.6) dolnej części ulicy Dobrego Pasterza. W pierwszym z terenów dopuszczalna wysokość do 5 kondygnacji, w większości wypadków wymagany jest też usługowy parter. Mimo niewielkiej dopuszczalnej wysokości budynków, na powierzchni 12,30 ha można osiedlić nawet 6 305,88 mieszkańców, co daje gęstość zaludnienia 51 267,34 os/km². Na drugim z obszarów powierzchnia 4,3 ha przyjąć może 2 352,94 nowych mieszkańców, dając gęstość zaludnienia 54 719,56 os/km². Jest to wynik, którego nie powstydziłyby się miasta wschodnioazjatyckie9. Widzimy, że gęstość zabudowy przewidywana w obszarach, w których mogą wciąż powstawać bloki, jest ponad dwa razy wyższa od zagęszczenia na najbardziej zaludnionych osiedlach modernistycznych, a więc np. nowohuckich Bieńczycach. Tymczasem nawet tam mieszkańcom zdarza się skarżyć na przeludnienie. Mają jednak luksus, którego lokatorzy zabudowy deweloperskiej nie uświadczą – zieleń. Na nowych osiedlach dużą częścią powierzchni biologicznie czynnej stanowią ażurowe betonowe kratki do parkowania. Uznaje się je za zieleń – w teorii w ich otworach może wyróść trawa. W praktyce to się, rzecz jasna, nie dzieje. Planowanie przestrzenne w Polsce jest pomyślane zgodnie z pewną przewodnią linią ideologiczną. W przegęszczonych planach nie idzie o kompaktowe miasto, o które dopominają się urbaniści. Kompaktowe miasto to przede wszystkim miasto, gdzie w zasięgu krótkiej, pieszej czy rowerowej podróży znajdziemy wszystkie najbardziej potrzebne usługi. By uzyskać tego rodzaju zwartość, akcja rozbudowy miasta musi być skoordynowana i skoncentrowana po kolei na poszczególnych obszarach jeszcze niezabudowanych. Tymczasem zgodnie z hegemoniczną ideologią polskiego planowania każda działka w mieście musi być możliwym źródłem zysku, nawet jeśli kończy się to chaotyczną, punktową urbanizacją w oddalonych od siebie obszarach miasta. Nakłady kapitałowe muszą być niewielkie, tak by umożliwić czerpanie zysku niewielkim deweloperom i firmom budowlanym. Niskie i ekstremalnie zagęszczone osiedla na małych (a więc względnie tanich) i niescalonych działkach10 obniżają też ryzyko inwestycyjne ze strony kredytujących banków. Podaż mieszkań w ramach pojedynczej inwestycji może ściśle odpowiadać potrzebom deweloperów. Wobec braku aktywnej polityki mieszkaniowej państwa i gmin klient i tak kupi wszystko. Niski wkład kapitału i niskie ryzyko gwarantują w polskim modelu spekulacji mieszkaniowej wysokie zyski. Przestrzennym korelatem tej ideologii są ekstremalnie przegęszczone i niewysokie osiedla bloczków na rozproszonych obszarach objętych planami przestrzennymi, które nie regulują niczego. Nietrudno zrozumieć, że w XXI wieku jedynym wyjściem dla miast może być prawdziwa koordynacja ich zabudowy plus uprzemysłowienie czynszowego budownictwa mieszkaniowego, tak samo jak przemysłowo produkuje się telefony i żywność – o czym pisałem w tekście o osiedlach modernistycznych. Żeby mieszkańcy mieli realny wybór tego, gdzie chcą mieszkać, budowania domów nie można przepuścić tylko inicjatywie prywatnej. Zrównoważona, mieszana gospodarka mieszkaniowa z udziałem państwa, gmin, spółdzielni i inwestorów prywatnych jest koniecznością, którą generują sprzeczności miast w Polsce i na świecie. Udział podmiotów publicznych (państwa i gmin) musi być jednak realnie aktywny, nie zaś opierać się na pozoranctwie i wysługiwaniu się spekulantom – do tego bowiem sprowadzają się wysiłki rządów Prawa i Sprawiedliwości. Paradoksalnie więc, chociaż nasze miasta wytwarzają poważne sprzeczności, wynikająca z nich konieczność budowania lepszych osiedli nie urzeczywistni się sama z siebie. By stała się możliwa, potrzebna jest uczciwa rozmowa o tym, co stoi jej na przeszkodzie. Tymczasem przeszkodą jest nie tylko naiwna wiara w dobre intencje deweloperów, to także naiwna wiara w marną regulację, jaką są obecnie plany zagospodarowania przestrzennego. Obliczenia gęstość zaludnienia na obszarach objętych MPZP w Krakowie pochodzą ode mnie. Chętnie przyjmę uwagi co do ich metodologii. 2A. Olbrysz, J. Koziński (2011) Raport o finansowych efektach polskiego systemu gospodarowania przestrzenią. 3O chaosie generowanym przez WZ-ki zob. C. Brzeziński (2013) Wybrane problemy planowania przestrzennego w Polsce, „Acta Universitatis Lodziensis. Folia Oeconomica” 289. 4Krowoderska.pl (2017) Ruczaj: Spacer po najnowocześniejszym osiedlu w Krakowie, a prawdopodobnie także w Polsce, „Krowoderska.pl” https://krowoderska.pl/ruczaj-spacer-po-prawdopodobnie-najnowoczesniejszym-osiedlu-w-polsce-galeria/ [23.05.2018]. 5Ł. Drozda (2018) Urbanistyka łanowa, w: tegoż, Dwa tysiące. Instrukcja obsługi polskiej urbanizacji w XXI wieku. 10Patologiczna struktura osiedli deweloperskich w Polsce wynika między innymi właśnie z braku scaleń gruntów (zob. Ministerstwo Infrastruktury i Budownictwa (2016) Problemy w dziedzinie planowania przestrzennego – materiał informacyjny na posiedzenie Komisji Samorządu Terytorialnego i Polityki Regionalnej w dniu 11 maja 2016 r., https://web.archive.org/web/20170214062613/http://mib.gov.pl/files/0/1797146/raportproblemyplanowaniaprzestrzennego.pdf). Najbardziej jaskrawym skutkiem jest urbanistyka łanowa – długie szeregi bloczków wybudowane wzdłuż dawnego chłopskiego łanu, otoczone parkingiem i oddzielone od siebie płotem (o skutkach odrolnień zob. C. Brzeziński (2013) Wybrane problemy planowania przestrzennego w Polsce, „Acta Universitatis Lodziensis. Folia Oeconomica” 289). W oczywisty sposób tworzą one przestrzeń nieprzyjazną dla pieszych – nie ma tam ulic czy placów, przy których mogłyby się znaleźć sklepy lub punkty usługowe, a idąc pieszo trzeba nadkładać bardzo duże odległości. Co ma wspólnego gomułkowskie Osiedle za Żelazną Bramą i Sputnik? Co łączy krakowskie osiedla Bieńczyc i chilijski cybernetyczny system modelowania ekonomicznego Cybersyn prezydenta Allendego? Jaki jest wspólny mianownik wielkiej płyty i jugosłowiańskiego programu kosmicznego? Przyszłość, towar deficytowy w 2018. Przyszłość, która w latach 60. na pęczki potrafiła kiełkować na peryferiach. Ale co gdyby w 2049 czy 2060 cały świat wyglądał jak modernistyczna Nowa Huta? Finansjalizacja gospodarki, zanik zewnętrzy kapitalizmu i pozbawienie mas ludzi środków do życia sprawiają, że 1% planety to luskusowe wille, 20% to domy obciążone hipoteką, reszta to slumsy. Dzisiejsze miasto to produkt finansowy par excellence. Krytyka miasta modernistycznego jest u nas importem z USA. Jednak krytyka ta słabo się ima realnie istniejących maszyn do mieszkania – naszych osiedli lat 60. i 70. Po pierwsze – były one wyjęte spod nadrzędnej zasady zysku. Można powiedzieć, że odnosząc długowieczność dzisiejszego długu do ówczesnego czasu oczekiwania na budowę – wyjęte były spod zasady niedoboru. Po drugie – struktura ich ludności była względnie bliskim odbiciem struktury całego społeczeństwa. Również krytyki gadających głów w kraju nie trafiają celu. Urbanistyka osiedli modernistycznych nie jest winna rozproszeniu miasta. Gęstość zaludnienia jest tam większa niż w kwartałach kamienicznych, a jednocześnie większy jest udział przestrzeni zielonych1. Oczywisty oddech dla Ziemi. Reszta krytyki to czysta inżynieria. Przyjmijmy zuchwale, że krakowskie Bieńczyce mogą stanowić wzór dla całego świata. Około 2060 roku liczba ludności na Ziemi sięgnie 10 miliardów. Jeżeli założymy, że każda osoba mieszkająca na Ziemi zostanie zakwaterowana w replice Bieńczyc, jaką osiedla te zajmą powierzchnię? 28 200 os/km² wynosi średnia gęstość zaludnienia 19 krakowskich osiedli modernistycznych wybranych do programu rewitalizacji2. Z prostego dzielenia wynika, że powierzchnia osiedli dla ludności Ziemi w 2060 musiałaby wynieść 354 610 km². To nieco mniej niż powierzchnia Polski, 686-krotność powierzchni Warszawy i 3546 razy powierzchnia Paryża3. Raptem 2,5 promila powierzchni lądowej Ziemi. Konsekwencje można mnożyć, można też zarysować jednym zdaniem – dużo mniejsze obciążenie środowiska naturalnego i dużo wyższy standard życia niż na planecie slumsów. To dużo czy mało? Od 2009 roku w miastach mieszka większość ludności świata: ok. 3,97 miliardów ludzi. Zgodnie z danymi Global Urban-Rural Mapping Project obszary miejskie zajmują ok. 3 500 000 km². Dane te opierają się na zdjęciach satelitarnych i widoczności świateł w nocy. Przypuszcza się, że są one około dwukrotnie zawyżone. Można więc przypuszczać, że obecnie miasta zajmują ok. 1% powierzchni lądowej kuli ziemskiej4. Oddolność oddolnością, ale jest rok 2018, a kwestia miejska wciąż może być rozwiązana tylko planowym ruchem znoszącym. Jeśli nie możemy go zrobić, chociaż go pomyślmy. Tymczasem: kolejny triumf planowej prefabrykacji nad lepianką. Nie było trudno sobie go wyobrazić, jak widać. 1Można tu porównać wskaźniki gęstości z Wielokryterialnej analizy 19 osiedli zabudowy blokowej położonych na terenie Gminy Miejskiej Kraków (http://www.bip.krakow.pl/?dok_id=51896) i Lokalnego Programu Rewitalizacji Starego Miasta dla Krakowa (http://rewitalizacja.krakow.pl/rewitalizacja/7348,artykul,lpr_starego_miasta.html). W Wiedniu tylko jedna dzielnica ma większą gęstość zabudowy. Jest to też dość przeciętna gęstość zaludnienia dla dzielnic paryskich. 3Powierzchnia Polski, Warszawy, Paryża i lądów Ziemi za stosownymi artykułami Wikipedii, przepraszam. Die Idee Fouriers, durch das Phalanstère-System das sämtliche Meerwasser der Erde in Limonade zu verwandeln, war sehr phantastisch. Allein die Idee Bernsteins, das Meer der kapitalistischen Bitternis durch flaschenweises Hinzufügen der sozialreformerischen Limonade in ein Meer sozialistischer Süßigkeit zu verwandeln, ist nur abgeschmackter, aber nicht um ein Haar weniger phantastisch.